These days manufacturers tend to use the word 'customer' to refer to the retailers who they supply directly, and use the word 'consumer' to refer to the person who ultimately buys the product. Here I've decided to substitute the word 'collector' for the person who finally bought/received the BAYKO, which seems altogether more appropriate. 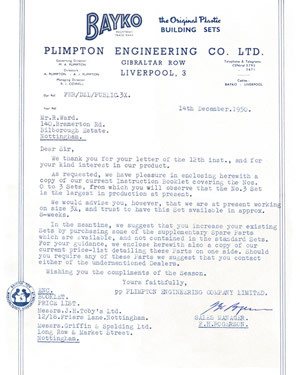 This section shows examples of letters sent by Plimpton [or MECCANO if I come across any] direct to BAYKO collectors in response to their enquiries. I feel personally frustrated that, when I wrote about the restricted range of BAYKO Roofs, not long before the MECCANO takeover in 1959, I never received a reply - anyone would think they were busy! if you've a letter to add to this page. 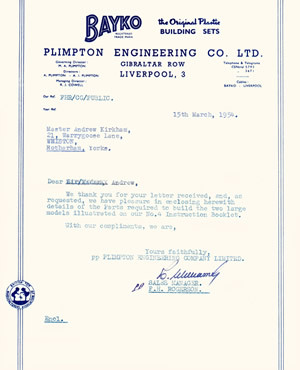 This letter [right] was sent to a BAYKO collector, in Weston Super Mare, Somerset, in August, 1948. It is interesting as it clearly responds to an enquiry about the possibility of adding to a pre-war collection. It came with a large job lot, including mid 1930s brown and cream BAYKO, and a set #21. Matching the former was doomed to fail as Plimpton hadn't produced parts in that colour scheme for at least eleven years. The original collection had been passed on to a younger sibling - large clerical families were not unknown. The set had been passed on to another branch of the family - in which case white lies would have been told in the original enquiry. The set had moved via the second-hand toy market - in which case blatant lies had been told. The set was still firmly in the hands of its original owner, in which case we have an early true collector. …though I can't justify it! Thanks to Robin Throp for finding this one for me. Judging by the size of the collection, “Messrs Coulstings” will have done rather well out of the recommendation! We thank you for your letter of the 6th instant, and we have pleasure in enclosing our latest price list for your interest and guidance. We also enclose our latest booklet, @ 1/9, to cover cost and post, which you may remit at you convenience. As you will see illustrated herein, the attractiveness of the new range of sets we now manufacture. We would suggest that you compare your set with one of the equivalent in the new range, and then purchase all the 'parts' you will require to convert your old-type set into a completely new outfit. The new Bases cannot be used in conjunction with the old, but can still be used separately for making models with new parts, as all parts, both old and new, are of a standard size, and fit on the base easily. All sets and parts as listed can now be obtained from your nearest Bayko dealer who is Messrs Coulstings, 24 High Street, Weston Super Mare. We feel sure if you contact this store they will deal with your Bayko requirements with every courtesy and satisfaction. 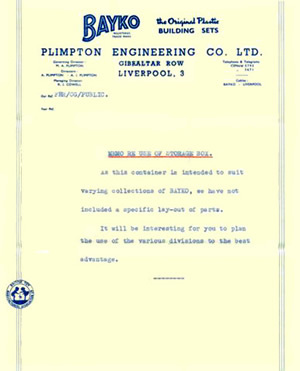 pp THE PLIMPTON ENGINEERING COMPANY. It is signed off by somebody who's signature looks like Warren. This is an interesting letter for students of the retail market place in the late 1940s. A lady, Mrs. L. W. Byford, had evidently written to Plimpton to buy either a BAYKO set or some spare parts. I suspect the former. 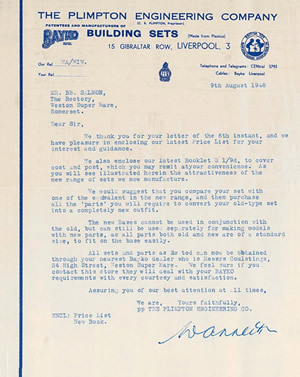 The letter shown here [left] is a polite rebuttal, stating that “in fairness to our dealers, we cannot supply either Bayko 'sets' or 'separate parts' direct to the public”. This has the general appearance of a standard letter, but the use of quotes twice in the script may be suggestive of a more personal response. If the job lot of BAYKO I recently picked up on eBay [with this letter] is anything to go by, “MESSRS W.S. COWELL LTD, Buttermarket, Ipswich” did 'very nicely, thank you' as a result of this referral by Plimpton. Quite whether the refusal to supply direct was born of operational convenience, or general pressure from retailers, I don't know. I'll let you make up your own mind. I'm pleased to say that this document is mine. We thank you for your kind enquiry, but we regret to advise you that our dealers, we cannot supply either 'Bayko sets' or 'separate parts' direct to the public. We feel sure you will appreciate this. We append below dealers in your district who will deal with your requirements with every courtesy and satisfaction. In the event of any difficulty arising perhaps you would be kind enough to contact us again. It is signed off by Sales Manager, Fred Rogerson. This is, in part, an interesting letter. Mr. R. Ward, had evidently written to Plimpton on December 12th asking about larger BAYKO sets, set #3 being the largest available at the time. The reply, dated Thursday, December 14th - not a bad response time - refers Mr. Ward to a choice of Nottingham retailers to add to his collection “by purchasing some of the supplementary Spare Parts which are available”. …there is one further short paragraph with some very interesting information. “We would advise you, however, that we are at present working on size 3X, and trust to have this Set available in approx. 8-weeks”. This brings forward the estimated launch of conversion set #3X to early February, around the 9th, which was a full year before set #4 itself was launched. We thank you for your letter of the 12th inst., and for your kind interest in our product. As requested, we have pleasure in including herewith a copy of our current instruction booklet covering the Nos 0 to 3 sets, from which you will observe that the No. 3 Set is the largest in production at present. We would advise you, however, that we are at present working on size 3X, and trust to have this Set available in approx. 8 weeks. In the meantime, we suggest that you increase your existing Sets by purchasing some of the supplementary Spare Parts which are available, and not included in the standard sets. for your guidance, we enclose a copy of our current price-list detailing these parts on one side. should you require any of these Parts we suggest that you contact either of the undermentioned Dealers. Wishing you the compliments of the season. It is signed off by no less a person than Fred Rogerson, the Sales Manager. …however, the storage box referred to in the letter is very much a 1950s product, so we can probably narrow this down to between 1950 and 1955. The lack of a specific date also lends weight to the theory that this was a standard, probably pre-printed letter, however, it looks very much more like a normal letter, so it may have been 'freshly typed'. 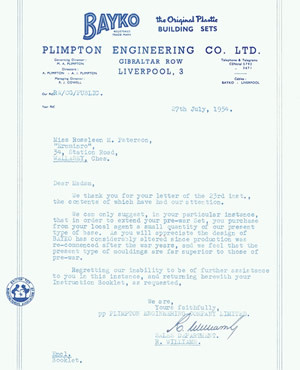 The typed envelope [above] enclosed this letter, and gives a similar impression of being a standard, pre-prepared item. As this container is intended to suit varying collections of BAYKO, we have not included a specific layout of parts. It will be interesting for you to plan the use of the various divisions to the best advantage. Alas I've never seen any published reference to these storage boxes, so all the information comes from direct observation. …click here to find out more. Thanks to Stan Curran for this image. You might find it interesting to compare this letter, which certainly gives the impression of being personal, with the two standard, pre-printed(?) ones below. …which, together, were widely used by Plimpton for promotional purposes, as well as gracing covers of the set #3X manual. …click here for more information. …so is the 'autograph' of Fred Rogerson, BAYKO Sales Manager. Thank you for you letter of the 24th instant and are pleased to hear that your daughter is so interested in our product, and that you have one of our No. 4 outfits. As requested, we have enclosed a list of the parts required to build the large models illustrated in our new instruction booklet. It is, again, signed off by Fred Rogerson, the Sales Manager. Thanks to Johan Debeuf for finding this one for me. This letter [left], dated March 8th, 1954, should be read with reference to both the one above, and the one below, as all three enclosed Parts Lists for the Block of Flats and Country Club models from the set #3x manual covers. about the role of these models. This letter is pretty well identical to the one below, which proves to me that much of the communication used standard letters. A negative comment - I'd rather they hadn't just crossed out the ubiquitous “Dear Sir/Madam” but started again with “Dear Derek” - not indicative of the highest quality standards I'm afraid. It's also nice to be able to include the envelope [above right], complete with its BAYKO franking which is clearly visible. We thank you for your letter received, and, as requested, we have pleasure in enclosing herewith details of the Parts required to build the two large models illustrated in our No. 4 Instruction Booklet. These items are shown courtesy of Peter Hilton and Andrew Lance of the HORNBY Railway Collectors Association. This letter [right], which is dated March 15th, 1954, just a week after the one above, should be read with reference to the two above, as they both enclosed Parts Lists for the Block of Flats and Country Club models from the set #3x manual covers. This letter is pretty well identical to the one above, which proves to me that much of Plimpton's communication used standard letters. This letter was p.p.-ed by what looks like C. Williams, on behalf of F.H. [Fred] Rogerson - Sales Manager since 1938 - indicating that the supply of this Parts List was firmly in the Sales / Marketing arena - but where was our Fred? A negative comment - I'd rather they hadn't just crossed out the ubiquitous “Dear Sir/Madam” but started again with “Dear Andrew” - not indicative of the highest quality standards I'm afraid. The contents of this letter are identical to the one above, reinforcing the standard letter theory, though here the signatory is R. Williams on behalf of Fred Rogerson. I'm pleased to say this letter is also mine. 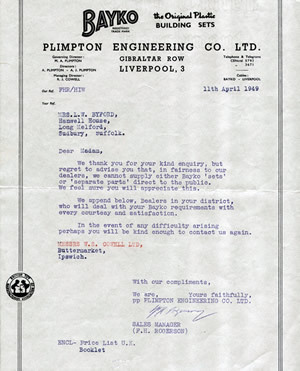 You have to admire the optimism of the recipient of this letter [left] who, just before the 27th July, 1954 response date, wrote asking for some form of pre-war product - at least thirteen years after production ceased. The BAYKO franking is clearly visible on the envelope [above]. I cannot explain why the envelope is dated a month later than the letter!!! I really don't think there is any particular point to make, so I'll leave the letter to speak for itself. We thank you for your letter of the 23rd inst., the contents of which have had our attention. We can only suggest, in your particular instance, that in order to extend your pre-war Set, you purchase from your local agent a small quantity of our present type of Base. As you will appreciate the design of BAYKO has considerably altered since production was re-commenced after the war years, and we feel that the present type of mouldings are far superior to those of pre-war. The letter was signed off by R. Williams of the “Sales Department”. Again, I'm pleased to be able to say that this document is mine. …click here to for more on the B.B.D.&G. letter. …click here for more on these 'with compliments slips'.